Hampton Court MYC hosted round (1) of the Met. & Southern District One Metre championship on the 22 February 2015. 21 skippers attended the open meeting with two coming from the South West District and one very keen competitor who travelled to the event on public transport, complete with boat and rigs. After completion of the usual Race Officer briefing the two seeding races kicked off shortly after 10am. It soon became evident that there were some very evenly matched sailors competing for the top spot. Racing took place during the morning in no.1 rig and the wind strength gradually built as predicted. By lunch time a couple of boats had changed down followed by the rest of the fleet shortly afterwards. Rain had set in for the last two complete races and the race scores at that point were very even. 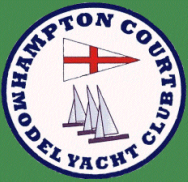 At the time of the penultimate race the lead was narrowly held by Derek Morland of Gosport MYC and for the last A heat, the Race officer , realising that the result of the final race would likely determine the winner set a double length course. In fact the event could have been won by anyone of five skippers at this point. After eight complete races, Ken Binks from Eastbourne MYC had won the day in what was a very competitive days racing. Six different helms had notched up a race win to their name. In second place came Dave Andrews (HCMYC) followed by Derek Morland (Gosport). An excellent start to the District One Metre series. My thanks go to the race team - Laurie Bower, Graham Gurney, Colin Boulding and Desmond Tew.